It's that time of year again to refresh your closet. Get rid of the heavy jackets and sweaters, and bring out that funky shirt and all those beautiful clothes you wore so much last year. But now you are bored of them? That's alright: someone will make them awesomely new. 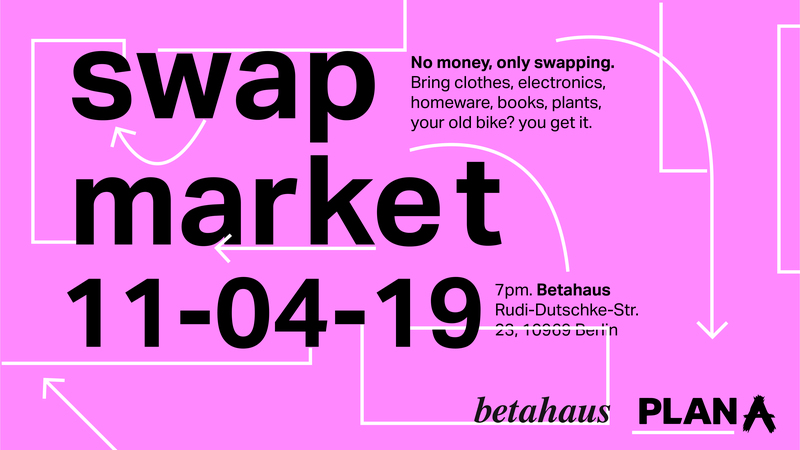 Together with Plan A, betahaus invites you to come swap some old new clothes and learn/share your concerns about the fashion industry and its costs; discuss and practice solutions on this regard and meet some pretty nice guys and gals. You bring what you have. - It fits you. You love it. We will be collecting the clothes the whole day until 18:00h next to the reception, so we can separate and organize them to make it easy and pleasant for you to sneak through. THIS IS A CASH-FREE EVENT. There won't be any items for sale, including drinks nor snacks - but feel free to bring your own.